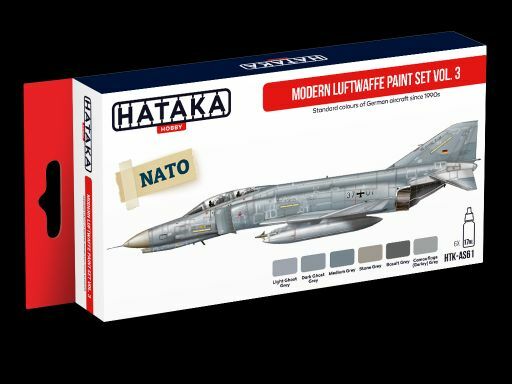 Starting from "forest" Norm 83 camouflage scheme and having drawn lessons from too complex (and too expensive) Norm 81 scheme of F-4Fs, Luftwaffe in 1990s turned towards grey scheme based on US Federal Standard colours (similar to Tactical Paint Scheme widely used by US air forces). Norm 90J pattern was introduced onto both interceptor types - F-4F Phantom IIs previously used by West Germany and MiG-29s inherited after East German AF. Later the similar scheme was introduced as Norm 95 onto Tornado fleet. Together with acquisition of Eurofighter Typhoons a new, one-colour scheme was adopted. HTK-AS61 includes standard colours of German aircraft since 1990s.